O chionn deich bliadhna, ghabh buidheann de dh’òigridh ann an Leòdhas ceum mòr airson sgioba iomain do dh’inbhich a stèidheachadh san eilean. Bha Eòghan againn an-sàs ann, agus e a’ coimhead air ais air turas iongantach Camanachd Leòdhais. O chionn deich bliadhna an-diugh, chaidh mi an-sàs ann an gnothach a thug os làimh mo bheatha uile gu lèir. Uaireannan, bidh mi a’ saoilsinn air dè bhiodh air tachairt mura robh rudan mar a bha iad. Sin mar a tha an saoghal – na murarobhaichean. Mura robh an Dotair Barden nach maireann agus a bhean chòir air leughadh ann an leabhar mu seann chleachdaidhean na Bliadhn’ Ùir anns an Eilean Fhada. Mura robh grunn mhath de bhalaich uile mun an aon aois a bha air a bhith dileas dhan spòrs agus a bha air ionnsachadh fo stiùir Bhoyd MhicCoinnich a chluich do Loch Carrainn. Mura robh mi air am bogsa a thaghadh airson a dhol àite sam bith ann an Alba airson teagasg. Mura robh mi air Pòl Diuc fhaicinn anns an Lanntair aon oidhche agus boillsgeadh de chuimhne agam gur ann à Baile Ùr an t-Slèibh a bha e. Mura robh Stiùbhart “Tyson” Caimbeul agus Donnchadh Mac a t-Saoir air an dachaigh a dhèanamh ann an Eilean an Fhraoich. Mura robh tidsearan eile ann a thogadh an eallach anns na sgoiltean nuair a dh’fhalbh mi. Mura robh pàirc mòr gu leòr ann an Siabost. Mura robh sinn òg is gòrach. 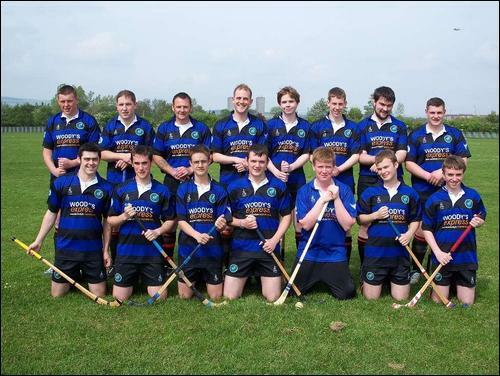 Camanachd Leòdhais. An sgioba beag a rinn an gnothach. Deich bliadhnaichean on a thòisich sinn an cath airson àite ann an saoghal na camanachd. Is cuimhne leam e mar a bh’ ann an-dè a bha e. Thàinig sinn cruinn còmhla anns an t-sèomar-theagaisg agam ann an seann Sgoil MhicNeacail, dubh na h-oidhche ann mu leth-uair an dèidh còig an tùs na Dubhlachd. Bha sinn air bun-stèidh aig sgioba eile a ghoid on eadar-lìn is atharrachadh. Chuir sinn a-steach gum bu chòir dhan chomann a bhith a’ brosnachadh iomain ann an Leòdhas, Na Hearadh agus Bearnaraigh Mòr. B’ fheudar dha a bhith a’ cur taic ris a’ Ghàidhlig cuideachd. An-uairsin, thagh sinn na h-oifigearan. Bha Micheál an rùnaire ochd-deug, cha robh Sean, an ceann-suidhe buileach na bu shìne, bha mise nam mhanaidsear, gun ach ceithir bliadhna de dh’eòlas mar chluicheadair iomain. Thagh sinn lèintean dubh is gorm airson dà adhbhar – nach robh sgioba eile san spòrs a’ cosg nan dathan sin, agus gun robh Peadar Gomez a chuir air dòigh taic-airgid o Woody’s Express a’ cur taic ri Internazionale. Chuir sinn a-steach gu cupannan Chomann na Camanachd., rud nach d’ rinn sgioba às an Innse Ghall riamh roimhe. Bha an aisling beò. Dh’obraich sinn gu cruaidh gus sgioba a thoirt gu h-ìre. Lorg sinn daoine a’ fuireach san eilean aig an robh eòlas. Chruinnich sinn airgead. Chuir sinn air dòigh geam càirdeil le Loch Bhraoin. Thug sinn sùil air an leabhar iongantach aig Màrtainn Dòmhnallach – Skye Camanachd – A Century Remembered – agus chuir sinn eòlas air na h-aon argumaidean agus deasbadan a thaobh siubhail a dh’fhuiling na Sgitheanaich o chionn còrr is ceud bliadhna. Is e caraidean dìleas, taiceil a tha air a bhith anns na balaich gheala à Port Rìgh rè ùine agus tha an t-aon-eòlas sin air siubhal agus strì a’ cumail an dà chomainn faisg. Chòrd a’ chiad bhliadna glan rinn, le turas ceithir làithean a Ghlaschu (fad mus robh bàta na Sàbaid ann) airson a’ chiad gheam chupa againn a chluich an aghaidh Ghlaschu Mheadhan-Earraghaidheal. Ach cha bheir còrdadh thu ach gu h-ìre, feumaidh tu neart cuideachd, agus bha sinn feumach air ann am pàilteas anns na bliadhnaichean as dèidh sin. Thàinig sinn an aghaidh cuid de dhùbhlannan àbhaisteach, balaich a’ fàgail airson obair is oilthigh mar eisimpleir, agus dùbhlannan a chuireadh sgiobaidhean eile fodha – ged a bha dròinnidhean mòra an aghaidh a’ Ghearasdain, Chinn a’ Ghiuthsaich, an Eilein Sgitheanaich goirt, agus bha airgead is uidheamachd an-còmhnaidh teann, ’s e bàs cluicheadair òg an rud a bu mhiosa a dh’fhaodadh tu fulang. Thàinig am buille bu chruaidhe as t-samhradh 2009. Craig Moireasdan, nach robh ach fichead bliadhna a dh’aois agus a bha dlùth ri mòran san sgioba, chaill e a bheatha ann an tubaist. Tha e ga chaoidh fhathast, ach thar nam bliadhnaichean, dh’ionnsaich sinn a bhith a’ tionndadh cruaidh-chàs gu cothrom. 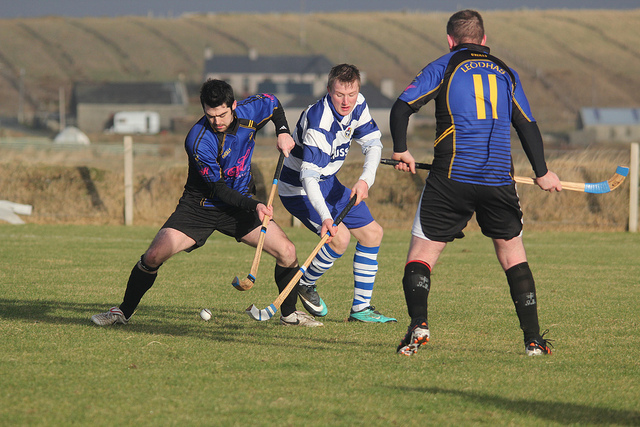 Tha Craig ga chuimhneachadh leis an fharpais shianaran gach samhradh, Craig Morrison Stornoway Sixes – agus gu deimhinne, ’s e a’ chiad chuairt den fharpais sin ann an 2010 a thug spionnadh às ùr dhan chomann air fad. Spionnadh a bheireadh sinn gu ceann-ùidhe anns na liogaichean nàiseanta. Coltach ri luchd-ionnsachaidh na Gàidhlig a bhios a’ strì gus fileantas a ruighinn, cha d’ rinn sinn adhartas mus d’fhuair sinn bogadh ceart, ach aig ìre a bha freagarrach dhuinn. Bha an strì airson an ìre sin a ruighinn na sgeulachd eile agus tha e ga innse gu math anns a’ phrògram aithriseach aig MacTV Camanachd Leòdhais – Dubh is Gorm. As dèidh bliadhna dheuchainn ann an 2011, cha robh roghainn aig Comann na Camanachd ach ballrachd sheasmhach a thoirt dhuinn (agus mar Fhreastal, rinn iad sin o chionn còig bliadhnaichean an-diugh fhèin cuideachd). Ann an sia bliadhnaichean, rinn an sgioba adhartas nach robh beag, a’ buannachadh, a’ toirt piseach air cluicheadairean agus a’ cosnadh cliù mar sgioba cruthachail, dealasach, cothromach a bheir deagh gheam dhut (agus o àm gu àm buaidh ort). Ged nach eil duaisean mòra air tilleadh a Leòdhas, ’s e na rudan prìseil a th’ ann an leasachadh òigridh, ballrachd mhòr agus treànadh cunbhalach gach seachdain – ’s iad an duais nas prìseile na airgead. Ma tha aon dragh ann, ’s e gu bheil an ìre de Ghàidhlig sa chomann air a crìonadh on a chaidh ar stèidheachadh. Feumar a ràdh ge-tà, gu bheil Gàidhlig gu leòr sa chomann fhathast agus tha e fhathast ri chluinntinn tric air a’ phàirc agus timcheall na pàirce. Bidh na Gàidheil fhathast a’ cleachdadh na Gàidhlig ann, gu h-àraidh an taca ri sgioba ball-coise Leòdhais is na Hearadh far is gann gum faigh iad balach le dà fhacal Ghàidhlig airson BBC Alba, ach ’s e as còireach gu bheil tòrr a-nise anns a’ chomann aig nach eil an cànan à Leòdhas fhèin agus air gluasad a-steach. Tha e na shamhla air mar a tha Gàidhlig air crìonadh gu mòr ann an inbhe agus cleachdadh ann an Leòdhas san deich bliadhna ud san fharsaingeachd. Ach tha mi a’ smaoineachadh gu bheil leasnanan mòra ri ionnsachadh airson daoine le ùidh mhòr ann an leasachadh na Gàidhlig – ’s e fìor ghnìomh choimhearsnachd a th’ ann an Camanachd Leòdhais – gu dearbh dearg fheumach air daoine dileas a bhios a’ saothradh gu dìcheallach ach cuideachd air coimhearsnachd a thogail le guailnean leathann airson eallach an spòrs a ghiùlan – ’s e sin a thog sinn ann. Tha strùctar cothromach agus taic o Chomann na Camanachd feumail airson cùisean furastachadh (agus airson na Gàidhlig, feuch Bòrd na Gàidhlig) ach thàinig a h-uile rud gu Camanachd Leòdhais tro neart an dùirn, fhallas a’ ghnùis, ghean a’ chridhe agus dheagh rùn na h-inntinn againn fhèin. Ma bha sinn nar suidhe air ar màs Leòdhasach a’ feitheamh, bhiodh sinn nar suidhe fhathast. Bhiodh an spòrs air sìleadh air falbh, gun chuimhneachadh na dùthaich fhèin mar a bha i roimhe. Tha sinne mar Ghàidheil feumach air mìle gnìomh beag airson ar cànan a shabhaladh. Deich bliadhna. Doirbh a chreids’. Àm airson cnuasachadh. Àm airson cuimhneachadh. Àm airson cràthadh. ’S e seasmhachd a th’ ann an cnag na cùise de leasachadh sam bith. Le gnothach sam bith, mas urrainn dhut coiseachd air falbh riaraichte leis na rinn thu agus le earbsa gun lean an strì as d’ aonais, ’s e sin toileachas agus tlachd. An ath bhliadhna, airson a’ chiad uair ann an deich bliadhna, cha bhi mise a’ cur orm geansaidh dubh is gorm. Bha an t-àm ann. Ach bidh an cath ga chur fhathast leis na seòid à Eilean Beag Donn a’ Chuain. 7 An Dùbhlachd 2016 in Cultar, Iomain, Spòrs.